Tomas Corcoran of Roscommon in action against Gary Brennan of Clare during their All-Ireland qualifier game in Pearse Stadium. Photograph by John Kelly. INCREDIBLE. The Clare senior footballers will hit the road again on Sunday when they head to Croke Park for an All-Ireland quarter-final meeting with Galway or Kerry. Clare played pulsating football in the opening 35 minutes with Gary Brennan ruling midfield and Jamie Malone continually running at Roscommon down the middle. Brennan was imperious in that opening half and although he tired after half-time, the Clondegad man showed the country what he can do.This was the first time Clare have won three All-Ireland qualifiers in the same season since the back door was introduced in 2001. First half goals from David Tubridy and Jamie Malone were the key scores. Malone’s goal was one of the best ever scored by a Clare team playing championship football. Seán Collins, Eoin Cleary and Keelan Sexton were all involved in setting up the lethal Corofin man who buried a sensational finish into the Roscommon net. Malone was also involved in setting up David Tubridy’s fifth minute goal, while the Doonbeg man also added a point from play in that half. Come the interval Clare led 2-6 to 0-7 and received a standing ovation from the Clare supporters in a crowd of 4,100. 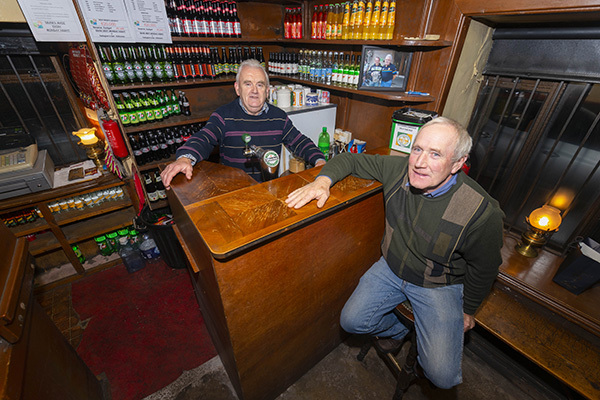 Many had been delayed on the journey to Galway from Clare, due to an accident near Clarinbridge but for those who saw that half, it was worth the journey. Dean Ryan and the outstanding Eoin Cleary completed Clare’s first half points tally. 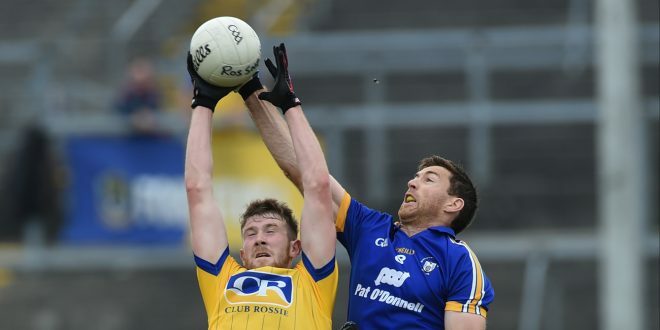 Clare were dealt a massive blow less than two minutes into the second half when Cathal O’Connor was red carded following a clash with Roscommon’s Niall Daly. Roscommon had full back Seán Mullooly sent off on a second yellow, 11 minutes later following a late tackle on Podge Collins. Clare were nowhere near as impressive in the second half and only added one point to their tally in the opening 26 minutes of the new half. Eoin Cleary pointed three minutes after the break. Twenty three minutes later Cleary pointed again after a foul on Jamie Malone. Roscommon’s first score of the second half was an Enda Smith goal in the 19th minute of that half. Clare lost possession and concentration near the sideline and briefly it looked as if Roscommon might rally. However Cleary, Shane McGrath and Seánie Malone put over invaluable points to seal a place in the last eight for Clare. Jamie Malone and Martin McMahon were outstanding as was Gary Brennan, particularly in the first half, although he had picked up a virus during the week. Thursday’s Clare Champion will feature a more extensive report, along with post match interviews, analysis and a preview of Sunday’s All-Ireland quarter-final in Croke Park. Clare: Joe Hayes (Lissycasey); Shane Hickey (Kilmurry Ibrickane), Kevin Harnett (Meelick), Martin McMahon (Kilmurry Ibrickane); Cian O’Dea (Kilfenora), Gordon Kelly (St Joseph’s, Miltown), Dean Ryan (Éire Óg); Gary Brennan (Clondegad-captain), Cathal O’Connor (Coolmeen); Seán Collins (Cratloe), Jamie Malone (Corofin), Eoin Cleary (Miltown); Keelan Sexton (Kilmurry Ibrickane), Pearse Lillis (Cooraclare); David Tubridy (Doonbeg). Subs: Podge Collins (Cratloe) for David Tubridy (47), Shane McGrath (Thomas Davis) for Pearse Lillis (55), Enda Coughlan (Kilmurry Ibrickane) for Keelan Sexton (60) Seanie Malone (Miltown) for Eoin Cleary (69), Pat Burke (Kilmacud Crokes) for Seán Collins (70) and Damien Burke (Cooraclare) for Jamie Malone (76). Scorers: Eoin Cleary (0-6 2f, 1’45), David Tubridy (1-2, 1f), Jamie Malone (1-0), Dean Ryan (0-1), Gary Brennan (0-1), Shane McGrath (0-1) and Seán Malone (0-1). Roscommon: Darren O’Malley; Seán McDermott, Seán Mullooly, Niall McInerney; John McManus, Niall Daly, David Murray; Cathal Compton, Cathal Keenan; Ultan Harney, Niall Kilroy, Enda Smith; Cathal Cregg, Done Shine, Ciaráin Murtagh (captain). Subs: Thomas Corcoran for Compton (32), Kevin Higgins for Harney (half-time), Cian Connolly for Murtagh (h-t), Diarmuid Murtagh for C Cregg (42), Conor Devaney for Higgins (46 BC), Fintan Cregg for Shine (67). Scorers for Roscommon: Enda Smith (1-1), Ciaráin Murtagh 0-3 (3f), Diarmuid Murtagh 0-1 (1f), Seán Mullooly 0-1, Niall Kilroy 0-1 (1f), Donie Shine 0-1 (1f), Conor Devaney 0-1.